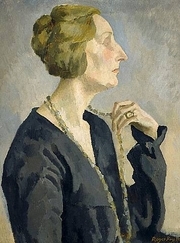 Edith Sitwell, the author of The English Eccentrics (1933), was herself the daughter of an eccentric, Sir George Sitwell, and his wife Lady Ida Emily Augusta Denison. In her autobiography, Edith said that her parents had always been strangers to her. She had two younger brothers, Osbert and Sacheverell Sitwell, both of whom grew up to be well-known literary figures and long-term collaborators. In 1912, at age 25, Edith moved to London, where she lived in a small, shabby flat in Bayswater with Helen Rootham, her former governess. Edith published her first poem, The Drowned Suns, in the Daily Mirror in 1913. Between 1916 and 1921 she edited Wheels, an annual poetic anthology compiled with her brothers. She also wrote nonfiction, including a biography, Victoria of England (1936). After Rootham become an invalid, the two went to live with her younger sister in Paris; Rootham died in 1938. Edith's only novel, I Live under a Black Sun (1937), was based on the life of Jonathan Swift. During World War II, Edith Sitwell returned from France and retired to the family's country house, Renishaw Hall in Derbyshire, with her brother Osbert and his lover, David Horner. She wrote by the light of oil lamps when the electricity went out and knitted clothes for their friends serving in the armed forces. The poems she wrote during the war, which included Street Songs (1942), The Song of the Cold (1945) and The Shadow of Cain (1947), were greatly praised. Still Falls the Rain, about the London blitz, remains perhaps her best-known poem. It was set to music by Benjamin Britten. In 1948 Sitwell toured the USA with her brothers, reciting her poetry and giving a reading of Lady Macbeth's sleepwalking scene. She made recordings of her poems, including two recordings of Façade (1922). She never married. Edith Sitwell was named a Dame Commander (DBE) in 1954. The following year, she converted to the Roman Catholic faith. She produced two successful books about Queen Elizabeth I of England, Fanfare for Elizabeth (1946) and The Queens and the Hive (1962). Edith Sitwell has a Legacy Library. Legacy libraries are the personal libraries of famous readers, entered by LibraryThing members from the Legacy Libraries group. » Edith Sitwell's legacy profile. Edith Sitwell is currently considered a "single author." If one or more works are by a distinct, homonymous authors, go ahead and split the author. Edith Sitwell is composed of 21 names. You can examine and separate out names.